The red pitaya cactus (Hylocereus undatus) grows wild in tropical America, from southern Mexico to Brazil, and travels under many dramatic aliases including dragon fruit, strawberry pear and night-blooming cereus. 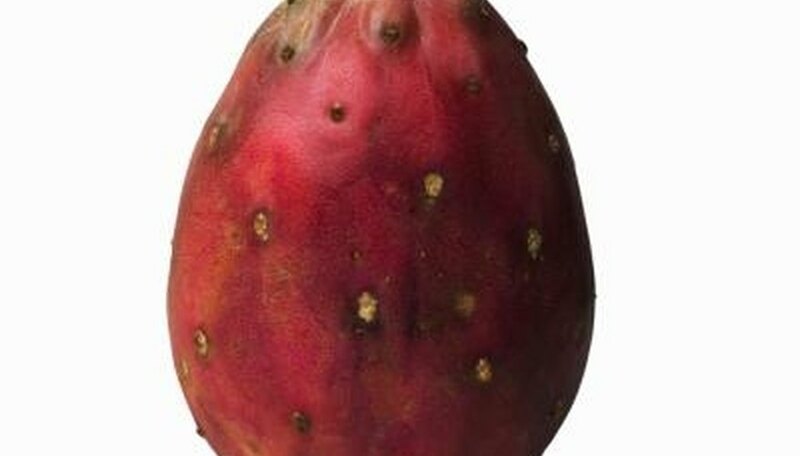 This cactus produces red berry-like fruit on its three-sided stem. For centuries, Latin Americans have eaten pitaya fruit and in recent times, its popularity has spread to international markets. Both Israel and Viet Nam grow pitayas commercially and export the fruit. If you imagine an ivy vine crossed with a Christmas cactus, you have the pitaya. The fast-growing pitaya cactus present in many-branched, jointed stems up to 20 feet long. While most pitaya stems have three sides, some have four or five. This green perennial usually has spines, although some varieties are spineless. The cactus uses its aerial roots to attach and climb. In the wild, the cactus eventually becomes a dense mass of stems, but growers prune cultivated pitaya. Pitaya flowers bloom only at night. If you are in the area, you will not miss the showy display. The bell-shaped white blossoms are enormous -- some 14 inches long -- with a strong, lovely fragrance and cream-colored stamens. Most pitaya flowers pollinate themselves, although several species require fertilization from another pitaya cactus. The flowers are edible -- cooked and eaten like vegetables -- as are the ruby fruit they produce. Pitaya fruit resemble large, hard strawberries. Red and oblong, the "dragon fruit" tops out at over 4 inches long. The thick peel often bears spines and those picking it wear heavy gloves. You slice open the fruit to find a white or red inside -- depending on the variety of cactus -- with numerous tiny black seeds. The fruit ripens on the vine and keeps for up to two weeks in the refrigerator. Eat pitaya fruit fresh or use the frozen fruit for jams, juice or ice cream. Those who dwell in tropical or subtropical climates can plant pitaya in the backyard. Pitaya cactus require full sun, temperatures between 65 and 77 degrees and protection from frost. Purchase and plant stem segments up to 15 inches long, and plan on erecting a strong trellis for these quick-growing plants. One mature plant produces about 220 pounds of dragon fruit each year for up to 20 years.